I think the key to good feedback in a workshop is probably 10% about the content, 10% about the delivery, and 80% about whether it is pitched at the level the participants expect and require. That's probably an exaggeration but you get my point. I've blogged on here before about how I run sessions around Web 2.0 and academia for the Researcher Development Team at York, and in the last couple I've really felt for a small number of participants who were at a stage beyond the level I was pitching at. The workshops are introductions so participants literally set up, for example, a Twitter account from scratch - so anyone who is already past that point but wants to know about content and tone, is doing far too much thumb-twiddling for my liking, until later in the session. With all that in mind, as of next academic year we're reworking the workshops, and in each case I'll run one 'A beginner's guide to' type session and one 'Improvers' type session, so people can get exactly what they need out of the workshops. We didn't have time to arrange that for this terms' workshops, so I produced the slides above to send on to participants of my introductory workshop, for those who wanted to go further. In January when the next set of workshops run (I don't do any in the Autumn term, because AUTUMN TERM), I'll flesh this out into a proper interactive 1.5 hour session. Have I left anything important out? One of the things I love about Slideshare is that you can update and reupload slides over the same URL, so you don't lose that continuity (and your statistics). So if there's anything you'd add to this, let me know in a comment, and I can eventually make a new and improved version to put online in place of this one. Number of followers isn't an end in itself. A smaller group of engaged followers who want to interact with YOU is far better than a huge group for whom you have to put on any kind of show. So while when writing in print it's important to adopt a style appropriate for the medium, I consider Twitter to be much closer to spoken communication. As long as you're prepared to deal with the consequences, why not just be yourself? I have read, and contributed to, an awful lot of writing online about Twitter in HE. Social networks in general and Twitter in particular are increasingly accepted as a valuable part of the academic world. If you want to know about how to use Twitter for communication, for building reputation, for research, then Google will provide you with endless hours of reading. However, using Twitter in teaching seems to be far more tricky and ambiguous. There are a lot more people asking 'Can we use Twitter in academic teaching, and if so, how?' then answering that question. Interestingly, there's a lot more info out there in using it in the school classroom than on using it in the University seminar room, lab, or lecture theatre. With that in mind, and to make the most of a real edtech zietgeist happening at the University of York at the moment, I put together a 1.5 hour workshop for academics, as part of a series I'm doing for the Learning & Teaching Forum. I really enjoyed putting this together because I learnt a lot, and spoke to a lot of academics doing really interesting things with tweets. The biggest issue in this area seems to be that you can't make students sign up for the platform, so how do you make sure no one is excluded if you're providing key info via Twitter (without you having to duplicate everything)? The first answer is embedding a Twitter stream in the VLE - there is a full guide on how to do that (with BlackBoard) in the handout which accompanied the session (embedded below). The second answer is projecting a hashtag onto the walls during teaching. Chemistry at York is, for some reason, always at the front of the curve with social media, and one of the things Simon Lancaster does is have a back-channel running on big screens during lab-sessions, using Tweetbeam, so that students who don't wish to sign up for Twitter can still get the benefit of seeing other students' tweets (and also pictures shared by Simon). I really liked this idea - I liked the ceding of control, the high risk of it, and I like the fact that the students don't abuse the trust, and take the opportunity instead to contribute enthusiastically and productively. Anyhow, here are the slides from the workshop - I hope if you're reading this you find them useful. If you're an academic and want to chip in via the comments with how you utilise Twitter, that would be great; if you're an information professional and you also run these sorts of workshops, I'd love to hear from you too. 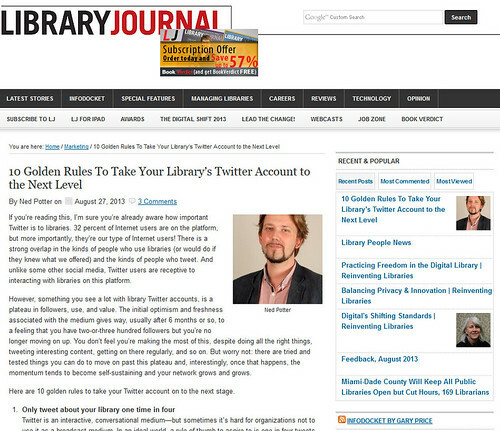 My current column for Library Journal is all about taking a Twitter account to the next level. It's hard to keep organisational accounts progressing - a lot of them plateau after a while - so there's 10 golden rules to get you past that point. 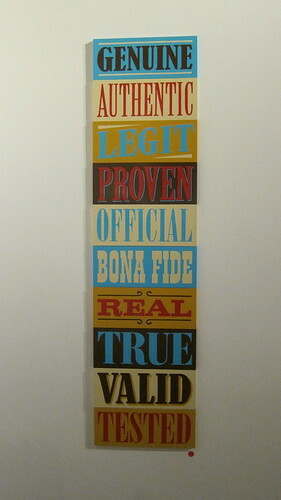 Finally, avoid these pitfalls . Read the full article with expanded information about each rule, here. Web 2.0 tools have finally moved firmly beyond the 'potential fad' stage, to gaining widespread acceptance as valuable weapons in the Researcher's arsenal. Statistics about social media are almost meaningless because a: there's so many of them and b: the information becomes outdated quickly, but at the time of writing it's thought that around 70% of academics use social media for personal use, and in my view we've most definitely reached the tipping point where social media's utility for professional use is properly understood. This is directly linked to the 'impact agenda' - the research shows that blogging about and tweeting about research results in more citations for that research, and pretty much everyone wants more citations. But becoming a networked researcher is about more than the REF-related bottom line, it's about being part of a mutually beneficial, supportive, and intellectually engaging community. The workshops themselves were really enjoyable and the researchers themselves very enthusiastic and engaged - a whole bunch of blogs and twitter accounts have already sprang up since they ran! But I'd like to improve them for next time around (we'll be running them twice a year from now on); whether you're a Masters / PhD researcher, an academic, or an information professional reading this, I'd be interested in your views on how useful these materials are, and any advice or tips or, particularly, examples, I should be referring to in future sessions. The three parts of the suite were designed to work together and separately - if you're only interested in one aspect of becoming a networked researcher, you don't need to look at the materials from the other sessions. Blogs and Blogging was the most successful session. The advice here is slightly York-centric in that we all have Google accounts, so we all automatically have Blogger blogs; if you're reading this at another insitution it's definitely worth considering Wordpress.com as your blogging platform. Better still, Wordpress.org, although that requires some technical knowledge. I've decided against embedding the materials for this one - there was a lot more group and collaborative work and the session was slightly shorter, so my presentation doesn't cover as much ground. But you can view the Dissemination and Collaboration Prezi here (the handout doesn't really add anything); it covers LinkedIn, Academia.edu, Prezi itself, and Slideshare. Any questions, comments or queries, leave them below. Things move a lot faster in library-land than people outside the profession would ever imagine - approaches, trends, philosophies and pedagogies all shift on an on-going basis. For this reason, the fact that something didn't work 2 or 3 years ago is really not a good enough reason not to try it now (and by the same token, the fact that something DID work 3 years ago isn't enough of a reason to keep doing it - we have to make sure it's still working in today's landscape). This happens a lot though - someone new comes into an organisation and says 'why don't we try such and such?' and the reply is 'oh we already did that; it didn't work' and that's the end of it. In effect, a policy has been built off the back of one experience - and that experience may not be representative anymore, because things change, and people change. p.s I was in a Lean methodology training session the other day, which is what inspired me to finish this post which has lain in my drafts folder for a couple of months. It turns out a lot of Lean principles are things I've been thinking about for a while, including the business of not just doing things one way because they've always been done that way, and not trying anything new because it has been tried once before in the distant past. Lean puts it in terms of the five whys - asking why (or more likely, 'yeah, but WHY though?') enough times to actually get to the root cause of something. Heidi Fraser-Krauss who led the session gave an example of a hospital who asked their staff to sign into a book when they rode their bikes into work. No one knew why, it had apparently ever been thus. The bike-book went back as far as the 40s and was, it turned out, something to do with rationing during the war... So it just goes to show, some processes need a quick currency-check to see if they're still needed. Eliminate waste.